On any weekday morning, students coast into school, transporting themselves and chauffeuring their friends. 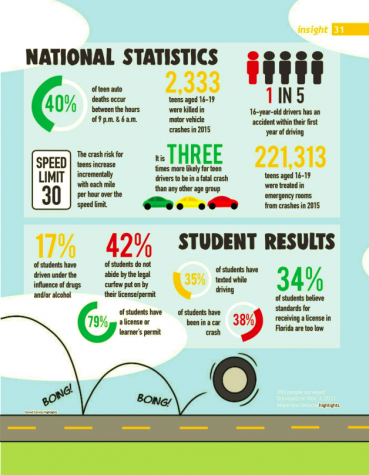 Though students abide by the traffic rules to cautiously traverse the parking lot, this is not always the scenario, as evidenced by the significantly high rates of teen crashes in the United States. In fact, automotive crashes are the leading cause of death for teenagers in the nation, as reported by a study conducted by the Children’s Hospital of Philadelphia Research Institute. The same study reports the vast majority of these teen accidents are caused by distracted driving, speeding and an unawareness of what is happening in the driver’s surroundings. This problem seems to affect most parts of the country, as a study by the Center for Disease Control (CDC) reported that though teenagers ages 15 to 19 make up a mere 7 percent of the population, they accounted for 11 percent of the total cost of motor vehicle injuries in the United States, a whopping $10 billion. 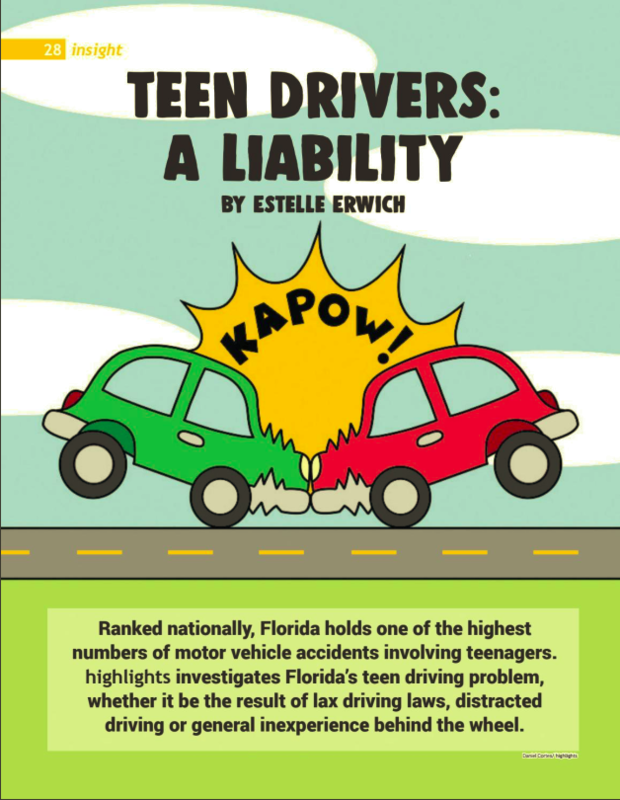 The issue is specifically prevalent in Florida, which is ranked number 34 out of 50 states in a CBS survey of the best teenage drivers in the nation. If this is the case, why are Florida’s transportation laws not enforcing better, more comprehensive driving instruction in classrooms across the country? Transportation laws depend on the state they are being enforced in, which means that blanket legislation cannot be passed to remedy the issue nationwide. It also means that there is no standard for what constitutes a mature and responsible driver— in New Jersey, it is a person who is 16 years old, while in South Dakota, one who is a mere 14 years and three months. Sixteen states require a driver to be older than 15 before granting a permit, while Florida driving legislature allows drivers on the road at the young age of 16 and with less required training. Where Florida diverges from other states is in its requirements for the acquisition of a permit. The state requires a mandatory drug and alcohol information course, which covers the dangers of driving under the influence of various substances, ignoring traffic signals or driving while drowsy. However, many states require mandatory driving lessons or driven distance requirements often of some 1,000 miles during the year before the license is issued. Florida only requires prospective drivers to complete a set amount of hours during the day, during the night and in unfavorable weather conditions, certified by a parent or guardian’s signature. Because of this, Florida is unable to control how much teenage drivers are practicing or know the validity of the statements they issue. Moreover, many adolescents will choose not to be taught by certified driving instructors because of the cost and lax requirements of the state, meaning crucial skills are being left out of their driving education. And, though new drivers must take a Traffic Law & Substance Abuse education course and pass a driving test, it is difficult to test all of the aspects which would signify that a driver is well-rounded enough to safely maneuver the roads. After passing this test, a 16-year-old driver may only drive between 6 a.m. and 11 p.m., and a 17-year-old between 5 a.m. and 1 a.m. unless he or she is able to provide proof of employment at a location they must commute to. These rules apply to any driver under the age of 18, and a driver over this age does not need to obtain a learner’s permit, and can drive with full privileges after passing the driving test. In comparison to other regions, these regulations are rather liberal. In some states, like Indiana, Illinois and Massachusetts, drivers under age 18 are considered to have “probationary licenses,” which have extensive rules and regulations. However, Florida does require a permit acquisition of 12 months, double the time of multiple states. Because of these lenient requirements, many teen drivers in Florida are not adequately prepared to maneuver the roads. According to the Florida Department of Highway Safety and Motor Vehicles, drivers aged 15-19 account for 4.7 percent of all drivers in Florida, but 6.97 percent of accidents as of Nov. 4. In Miami-Dade County (MDC), 15-19-year-old drivers make up 4.5 percent of all drivers, but account for 5.05 percent of all crashes. “Teens should limit the number of passengers in their vehicle to help keep their mind on driving and to keep the level of distractions down,” Colonel Gene Spaulding, Director of the Florida Highway Patrol said. According to the Miami Herald, distracted driving is the main problem for Floridian teens, with Florida drivers ranking second most distracted behind the wheel. One primary distraction is the presence of friends in the car, whether the driver is giving them a ride to a party or carpooling to school. In fact, a study conducted by the Center for Disease Control showed the rate of likelihood for a crash increases in direct correlation to the number of friends the driver is transporting. On “A Safer Florida,” a website focusing on promoting safe driving and a major proponent of Teen Driving Safety Week, this was listed as one of the deadliest distractions a teenaged driver can face. Recklessness can also be a culprit: 17 percent of 16 to 20-year-olds who were killed in car accidents in 2014 were intoxicated, and 53 percent of those accidents occurred on Friday, Saturday or Sunday nights. Inexperience also plays a role, as teenagers are much more likely to be in a car crash within the first three months of being a licensed driver, and crash rates are significantly higher for 16 or 17-year-old drivers as opposed to 18 or 19-year-olds. This adds to the argument that, when teenagers are allowed road access at younger ages without extensive driving instruction, they are often not sufficiently experienced or knowledgeable to safely navigate the roads. With so many contributing factors, it is difficult to understand clearly why these motor vehicle crashes are so frequent. Nevertheless, several protocols have been put into place to help remedy the problem. For instance, teens who are pulled over by police have a significantly lower alcohol content rate than adults to be considered under the influence, according to the CDC. “There is a program where we talk to parents, basically anybody that will listen, about both DUIs and underage drinking. MADD is very strong on underage drinking because of the fact that underage drinking means you’re more likely to become addicted and the addicted driver is very often the drunk driver,” MADD Victim Advocate Sally Matson said. “One of the major goals of our Florida Sheriffs is to protect Florida’s future by promoting public safety programs focused on our youth such as our Teen Driver Challenge program,” Walton County Sheriff Mike Adkinson, President of the Florida Sheriffs Association, said. These policies and initiatives, along with regulated driving privileges and harsher penalties for traffic violations, are thought to help guarantee safer roads. It is essential that these efforts are continued so that the next generation of American drivers are experienced, alert and cautious, allowing drivers, including teens and adults, to feel safer on the road. It is a great privilege to drive in teenage years, it grants teens freedom and the opportunity to make responsible decisions.